FERNDALE – “The best thing about curling is being able to throw a takeout,” said Brian Whitehead with a playfully competitive smile. “That’s a lot of weight to move.” In curling, teams of four people take turns “throwing” a 42-pound granite stone down a sheet of ice, aiming for a target called the “house,” Whitehead explained at the Affirmations LGBT Sports Fair, held April 10 at the Ferndale community center. Other players sweep the path before the stone to help control it. There are eight stones thrown and the team with the most in the “house” wins. In a take-out, the player is able to push their opponents’ stone out of place. 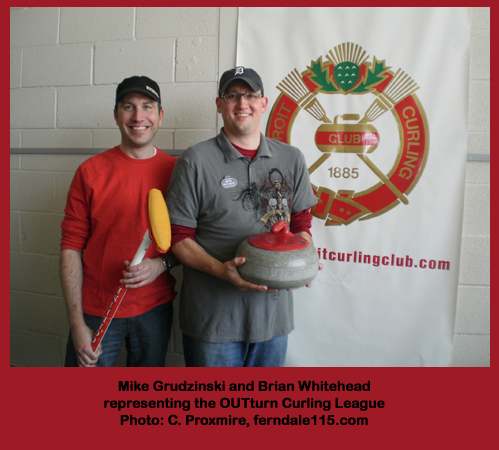 Whitehead, who is from St. Clair Shores, is a member of the OUTturn Curling League, which meets at The Detroit Curling Center in Ferndale. Which could explain the appeal: Curling is a sport where you can’t go straight. The league started last fall with just six members. Now there are 32 active members, many of whom are LGBT allies. The Detroit Curling Center has over 250 members with two leagues meeting every week night during curling season, which runs from November to the end of March. Whitehead grew up on a farm near the Canadian border watching curling on the Canadian Broadcasting Corporation. He’s been curling in the Detroit area for two and a half years. The OUTturn Curling League was one of a dozen teams that came to the LGBT Sports Fair. The event attracts teams from all over the Detroit area, including Dykes on Bikes, FrontRunners, Get Out Bike, Motor City Tennis Alliance, Metro Detroit Softball League, Michigan Panthers and Team Michigan Football, Paddle Dykes, Team Detroit Aquatics and Motown Drivers Golf. Affirmations also presented their softball team and yoga. Local massage expert Charity Mendoza of Greenleaf Bodywork also came out to give free massages, encouraging athletes to balance activity with relaxation. For more information about leagues at The Detroit Curling Club, visit www.detroitcurlingclub.com. For more information on LGBT sports and other Affirmations events, visit www.goaffirmations.org.